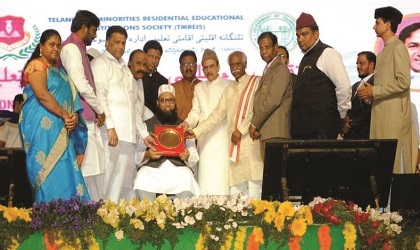 Hyderabad: Recognizing the contribution in the field of education, the Government of Telangana felicitated Mohammed Abdul Lateef Khan, Chairman of MS Education Academy on the occasion of Moulana Azad Day. It was organised by TMREIS (Telangana Minorities Residential Educational Institutions Society). Government of Telangana State, in a grand ceremony held at LB stadium on 11th November, 2017, awarded ‘Appreciation of Service Award’ to Mohammed Abdul Lateef Khan for extending his support in setting up and development of TMREIS with the help of MFERD (Millat Foundation For Education Research & Development). The TMREIS (Telangana Minorities Residential Educational Institutions Society), an initiative of minority welfare department of Government of Telangana, came into being in 2016 to give quality education to the weaker sections of minority community of Telangana. It has established 206 residential schools across the state to eradicate illiteracy from the society. These schools are being run on the line of corporate schools. It is to be worth mentioning here that before embarking on this ambitious projects officials of Minority Welfare Department of Telangana consulted MS Education Academy for help to run this mega project. Without any second thought MS Chairman welcomed the Government’s project and extended all his expertise in setting up the TMREIS schools. 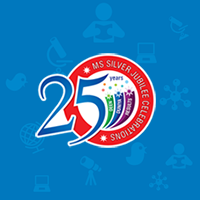 MS shared its academics techniques and curriculum with the TMREIS officials and showed them its working models. In the initials months, MS prepared academics planning for running the academic session and explained the management framework.